Cruise along two of Europe’s historic waterways and discover their varied traditions and cultures. A cruise along the Douro is bookended by two of Europe’s most beautiful and historic cities, the Portuguese city of Porto and Salamanca, home to Spain’s oldest university. Both date back to the Roman Empire, with their Old Towns now World Heritage-listed Sites. Further north, the Rhine curves through a storied landscape dotted with castles, vineyards and medieval towns. Watch legends come to life as you cruise through the stunning Rhine Gorge, past the infamous Lorelei Rock. 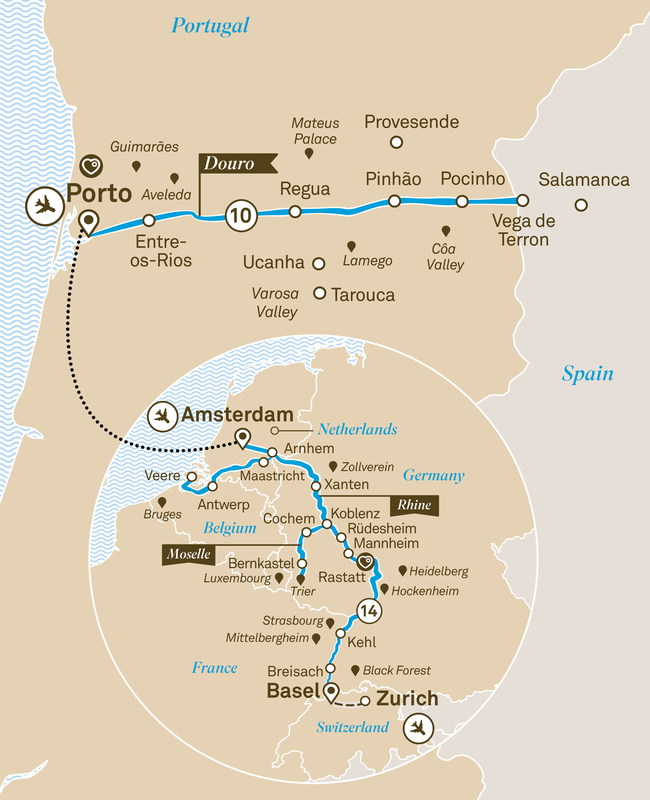 Your leisurely cruise of Portugal’s Douro Valley concludes this morning and you’ll be transferred to Porto Airport for your flight to Amsterdam.